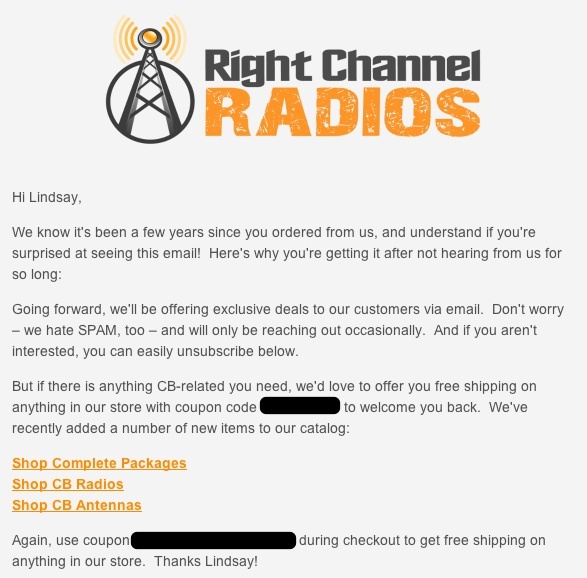 In this post I’m going to give you a sneak peek at the email marketing plan we’ll be implementing at one of my own stores, Right Channel Radios, using the email service Klaviyo. I’ll also be sharing the results of the campaign quarterly on the blog so you can see how this all pans out. There’s nothing quite like public accountability to spur action and progress! 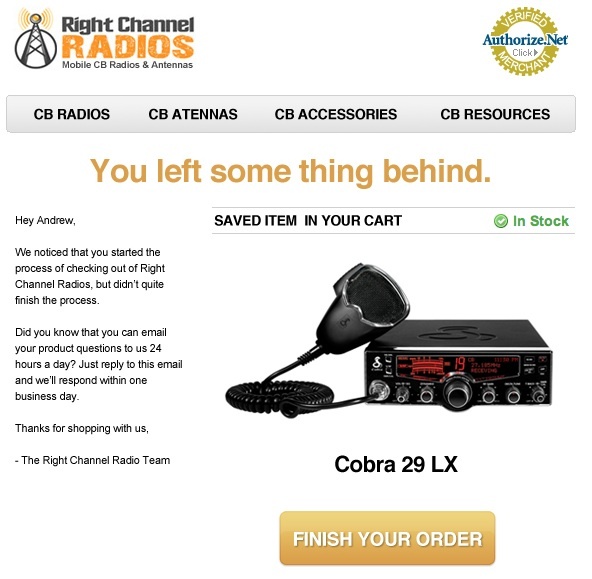 Sent the day after purchase, this email lets customers know about our radio installation and troubleshooting resources available on the website. The order of these requests is important: If a customer knows you’re first and foremost concerned about their experience, they’ll be much more likely to leave you a positive review. We only recently started asking customers to leave reviews, but have already generated 30+ reviews with a 9.1/10 satisfaction rating at TrustPilot. I especially like an excerpt from a recent comment: “To see how high their support is you would have to rent the space shuttle to see it”. Thanks, Greg! While this follow-up email is automatically generated, we make sure someone’s real name is at the bottom and not just a generic company signature . If the customer replies to the email, it gets routed to someone at our help desk for a fast response. About 3 to 4 weeks after purchase, our customers get an email asking them to review the items they’ve purchased. The email is personalized and has links to the review page for the exact item(s) they purchased. We also appeal to our customers’ sense of community by asking them to leave a review to “help fellow radio users” to improve our response and review rate. We’ve generated hundreds of reviews with this email, and it’s been instrumental in drastically improving our product pages with product reviews. For all three of these automated emails, we use the Follow-Up Email extension from aheadWorks for Magento. It’s a little tricky to get set up – and the documentation could use some improvement – but once it’s up and running it’s great. Overall we’ve been fairly impressed with the support from aheadWorks. On one occasion, they even wrote a custom patch to solve a problem we were having for free. Impressive! Going forward, we may switch these emails over to Klaviyo because they offer a bit more control, and we’d like to consolidate all our emails in one interface. In just the last few months, we started experimenting with sending cart abandonment emails to try to recover lost sales. Any time someone partially checks out and enters their email address but doesn’t finish their purchase, we follow up with a series of emails to remind them about their cart and to encourage them to complete the purchase. A regular monthly or biweekly mailing sent to all our customers. It will include heavily discounted products, new items and promotions. With Klaviyo’s product-based segmentation automation, we can automatically send a series of emails to a customer based on what they purchased. 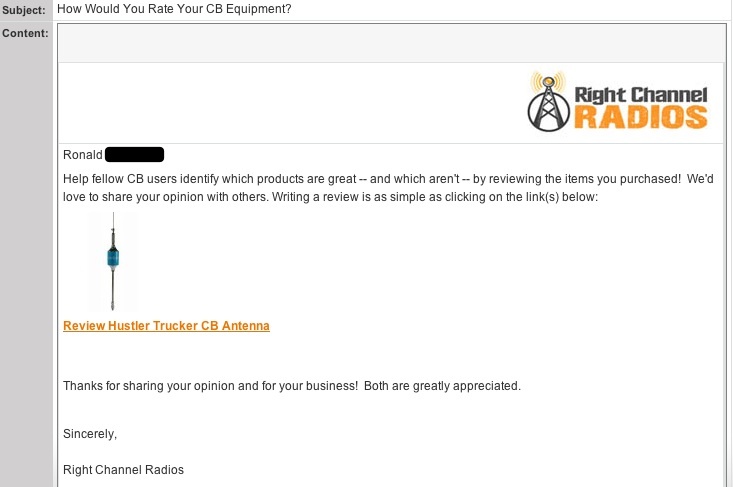 So a month after a customer purchases a radio we can automatically send them an email highlighting all of the accessories for their specific model. I think these emails have the highest potential to drive additional sales because they’re so targeted. They also allow us to do some pretty neat service-oriented emails. For example, if someone purchases a kit, we can send them specific instructions on how to install it on their vehicle. Very cool. Repeat customers are the lifeblood of any business, and we want to make sure we’re taking care of ours. We’ll be regularly sending out special promotions and incentives to all customers who have purchased from us twice or more. We want to make sure we’re taking extra-special care of our most loyal customers, so we’ll be taking great care of customers who order five times or more. Deep discounts, premium service and an increased emphasis on showing appreciation are what we’ll be focusing on with this group. We’ll be investing a ton of time into our email campaign this year, so it’s crucial to know how our efforts are translating into revenues. But visits from links in emails appear as “Direct Traffic” in Google Analytics. This makes it impossible to separate email visits (and purchases!) from other direct traffic like people typing the site address into their browsers or visiting from a link in a PDF. We need to be able to track our efforts and identify how much revenue is being driven by email marketing – both on an individual email basis AND from an overall email marketing campaign perspective. To do this, we’ll need to tag our links with special UTM (Urchin Tracking Module) parameters. By adding some custom text to the end of a link, you can tell Google Analytics exactly where the visitor who used that link came from. Google will take that information and incorporate it into clean, organized reports in your Analytics so you can tell exactly where your traffic is coming from and which sources are most valuable. A lot of people think UTM tracking is really scary and complicated, but it’s incredibly easy. You just have to append the appropriate tags to your links, and Google Analytics will automatically organize and filter your traffic. A big “thank you” to Ric Sake who made some great recommendations to make these parameters more customer-friendly given that customers can see them in the URL field. For example, our parameter for “enhancements” use to be labeled “upsells,” but few customers want to be “upsold.” But having their experience “enhanced” is something most customers would enjoy – something that is easily changed by thinking through our labeling a bit more. You can see Ric’s entire insightful comment here. Thanks, Ric! This identifies the exact message being sent. For our campaign, examples could include “july-newsletter” or “Uniden-Radio-Upsell.” These attributes help us tag individual messages. This should give you a good idea about how UTM parameters work, but for more information – including lots of ideas on how to best use them – see this guide by KISS Metrics. Will all this planning, tagging and segmenting actually make us any more money? You’ll get to find out! I’ll be publishing the actual results from this campaign on a quarterly basis starting in July. And I have to admit, it’s a bit nerve-racking to put a campaign publicly on the line like this … but I think it should make for some very valuable posts. I’d LOVE to see an immediate 25% sales boost that Ed said was possible from a well-optimized mature campaign, but I’m not sure if that’s feasible within three months. While I plan to get there within the next year or two, I think a 5% to 10% boost to sales from email during the campaign’s first quarter would be a solid start. Only time will tell, so make sure to check back in early July for the first report. Have questions about the new plan or what we’ve been doing historically with our transactional emails? Let me know in the comments below, and I’ll do my best to answer them! Did you enjoy this post? Please share it using the buttons below! Awesome post!! Thank you so much Andrew, this is amazing! Look forward to seeing the full casestudy of the effectiveness of the campaign for sure. I’m wondering about TrustPilot and why you send reviews there instead of elsewhere? Is it a key ecommerce review site? What advantages does it have? UTM by the way, if anyone is curious (as I was), stands for Urchin Tracking Module. Urchin was a web stat program eventually bought out by, surprise, Google. Thanks for the information. It will be interesting seeing how much it improves sales, which I’m sure it will. Good clarification on the UTM acronym – thank you. Why TrustPilot? Well, I could write an entire article on this but I think the existing services for helping merchants manage and collect customer reviews are TERRIBLE. Reseller Ratings is the big name, but they’re horrible – expensive and very particular about how you use their service. Sites like BizRate are free but low quality, and result in your customers who review you getting lots of SPAM. So I went with TrustPilot because they seemed to be the best possible candidate. I’m currently not using their paid service, but do ask people to leave a review of us on their site. I may upgrade to the paid version in the future as it includes automatic integration with our shopping cart, and the ability to shop review widgets of real-time reviews on our site. Great article Andrew, and looks like you are well on your way to some great returns on this shift! Look forward to your outcomes. I am interested too in your use of TrustPilot. Are they also indexed, or leveraged by Google to say add reviews to your Google Shopping listings, similar to how other review sites show up there as Seller Ratings too? Yep, I believe Trust Pilot is indexed by Google and they use their reviews in Google Shopping. At least, on their homepage they say “TrustPilot reviews may be included in Google Shopping results…”, so at least they’re integrated for the possibility of inclusion. And while I can’t remember which stores specifically I’ve seen them on, I’m fairly sure I’ve seen them pull from TrustPilot for reviews when reading merchant reviews via Google Shopping. Thanks for the post. I’m very interested in getting going with a service similar to Klaviyo. How did you go about selecting them for managing your e-mail communications? Were there any other services you also considered? Our storefront is powered by Shopify, which I see is supported by Klaviyo — but we also do a lot of business through eBay and Amazon. Do you have any feel for what level of effort would be to incorporate Klaviyo (or any other of the solutions you have evaluated) into these marketplaces as well? We looked at a lot of different options – including aWeber, MailChimp and others – when evaluating a platform to go with. What we really like about Klaviyo was that they offered incredible integration with our customer and purchase history so we could segment and automate mailings based specifically on what the customer had ordered. Most other platforms we looked at didn’t offer this. I don’t believe Klaviyo can integrate with eBay and Amazon, but I’m not sure. Hopefully Ed from Klaviyo can comment on that. One things I want to be transparent about: When we settled on using Klaviyo, I approached Ed about a partnership where he’d allow us to try the service for free for a period of time if we shared the results of our email campaign publicly. So we did initially pick them due to their merits, but are also receiving a benefit from them for now and so I wanted to make that clear as I’m providing advice on using them to you. Without that disclosure, there would obviously be a conflict of interest and I wouldn’t feel good about making the recommendation. For Shopify, setting up the integration with Klaviyo will take just a couple of minutes and you’ll see your data copying over almost right away (and we’ll help you get setup, sending emails and getting results for abandoned carts, following up with people who haven’t purchased lately, etc very quickly). For Amazon and Ebay, the two ways you can integrate now are either an easy spreadsheet upload feature or (for the more technical teams) via our API. While this requires a bit more work, we’ll likely be launching more in depth integration with Amazon / Ebay in the next few months. As we looked at other email systems (Mailchimp, Aweber, etc) we saw that none tied to purchases and all focused on newsletters only – which left a lot of money on the table for most Ecommerce stores who can get significant benefit from the other purchase-triggered emails. I’m always glad to help you get a trial of Klaviyo up and running or just to talk through the emails we see working – feel free to email me at ed.hallen@klaviyo.com if useful. Is Big Commerce supported by Klaviyo? I’m considering switching to Big Commerce and possibly now after reading this post, may have to switch email management provider as well. Currently, I use aweber. We’re getting ready to launch our BigCommerce integration in the next couple of weeks. What do you use currently? Great thing about tying your email to your shopping cart is that many of these emails can be automated, and you’ll see the direct impact of emails on purchases. Feel free to drop me an email – I’m glad to chat or help out (ed.hallen@klaviyo.com). Do TrustPilot reviews syndicate to Google Product Shopping etc? We’re reviewing some different review options right now for syndication and I would love to know if TP do. Kate – I believe they do, yes! That’s also one of the reasons we decided to use them. Thank you so much for sharing your emails! I think it’s a brilliant idea to ask for a review of your store first, and of the product much later – with my old store, I’d ask them to do both in one shot – which would be a little overwhelming for the customer and I had nearly zero response rates. I use bigcommerce, and as far as I know, they only allow you to send one email automatically. I’m going to look around for a way to hack that to be able to send two! I’ve found that having just ONE thing you ask a reader to take action on in an email can help increase the rate of response you get. When you ask people to do too much, they often do nothing at all. 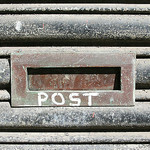 Your post comes at a perfect timing, I am currently meddling in email campaign strategy. I found your strategy helpful- in particular the 3-4 week follow up asking for product reviews. I currently provide follow up email to customer orders with links that customers can go to to track their shipments. They also receive automated updates on shipment tracking. I find that this approach does two things; 1) keeps the customer informed with up to minute info and 2) actually builds excitement and anticipation for their purchase. Most people are like kids with a purchase they make! they can’t wait to get it. 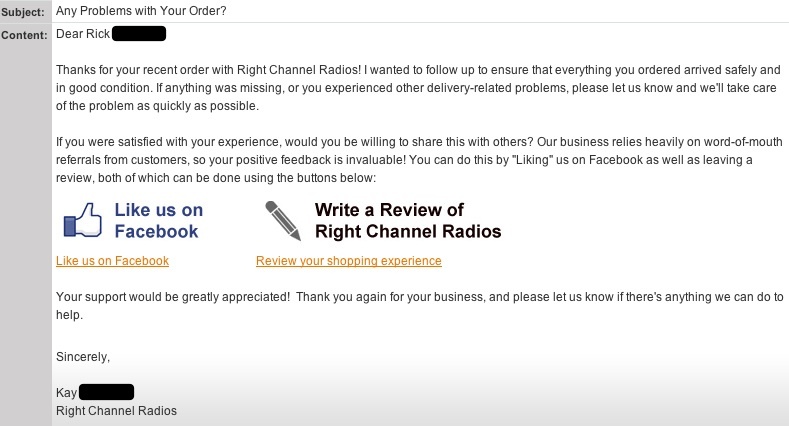 I think I will incorporate the 3-4 week follow up email asking for the product review(to help other customers is key). Currently, I only ask them to share a company review if they were satisfied with our performance. Thanks! very helpful. My sight is young, so I do not have dormant customers yet, however I will add this, that in previous worlds I have used this approach to bump sales +15% in a given period. I have however used a 6 month back window (not re-ordered- albeit that was in a slightly different business model). I have also had success with the punch line “We have missed you, CUSTNAME” and then offer up an incentive and product update as you have done. It can be very powerful. Thanks Andrew, always look forward to your posts. Thanks for sharing, Paul! I think your idea to offer updated shipping information is great – I know lots of people (myself included) will track a package’s progress across the country. Good idea. We also send shipment confirmations with tracking information as part of the transaction process, but I didn’t mention that in the post – probably should have. 🙂 And we may need to steal your “We have missed you…” subject line. It’s a good one. Best of luck with your young site! Great post again, thanks. I’ve a thought that is bothering me and is also an opportunity for me to give back in return for your sharing so much great information on this site. I feel customers do not like to feel exploited, or manipulated. For this reason I am worried about the UTM attributes that you are using. These are visible to the customer, and might give the impression that your emails are designed only to increase sales (exploit and manipulate the customer) rather than also helping the customer by guiding him or her to the things that he or she needs or would find helpful. “newsletter” – I like this one! Absolutely fantastic points! So good, in fact, that I’m modifying the post to reflect them and to change our strategy. Thanks, Ric! Ric – Just updated the post, as well as credited you with the suggestion. Again, thanks for the great feedback! Thanks for this great article and the great comments. I learned so much from this one post. I also contacted Ed regarding the e-mail management system. You’re very welcome – thanks Owen! Hi Andrew I just discovered your blog and am finding it very helpful. I work for a family business that manufactures and sells great automotive products (trailer hitches, tonneau covers and running boards). We’ve been successful selling on marketplaces like eBay and Amazon (5000 orders/month) but have had trouble carrying over that success to our webstore. We are only getting about 5 orders per day on http://www.automaxstyling.com and have yet turned a profit. I was wondering if you can give me some advice about how to leverage our marketplace customers and grow our webstore. We are currently not doing any email campaigns. Thank you Andrew. 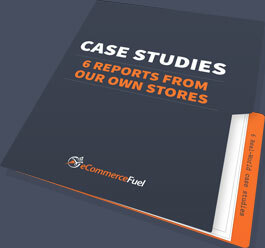 Hi Amy – are you using the shopping engines, specifically Google Product Shopping to generate traffic to the store? I have noticed that your website receives traffic from different search engines. Would you recommend a search engine submission service for me please. Thank you. You shouldn’t need to use an engine submission service. As long as someone, somewhere links to your site that’s all you’ll need. The engines will follow that link and find – and crawl – your site. Good plan. Although your strategy is very effective, I think it is to intensive. If it isn’t a secret, can you please tell us what is your unsubscribe rate and if you receive many emails from buyers complaining about too many emails. Thank you. Could you comment on why you think it’s too intensive? Would be interested to hear. Are in the early stages, so don’t yet have a good idea of unsubscribe rates but we’ll make sure to report on these in our first quarterly update. By too intensive I meant that your subscribers will get too many emails from one source. For example when I get many emails from one website, even if the website is very good, trusted, etc, I always get frustrated by the so many emails. Even if they contain different information, targeted at different actions, I do not like to receive many emails from one source. I remember when I receive emails from social network websites or even from some newsletters to which I have subscribed, my first reaction is: “Ohhh, again these people …”. This is why I think that sending too many emails, even if they all have different meaning, targeted to different action, it is not very good. I think that to get better results, we need to divide our subscribers into 2 categories: One category that receives many emails per day, from very different sources and another category are the people who receive few email (in general). So to people who receive many emails (in general), we must send fewer emails, but to people who receive few emails, we may send them all of our emails. A very fair point! We’ll need to test / watch unsubscribe rates to make sure we’re not mailing too frequently or overloading our list. That’s a fast way to get people to unsubscribe in droves. 1. Words of wisdom to never forget: You are not your customer. 2.There is no way the frequency outlined in his post could even remotely be considered "intensive". Good info, been using all these tips for a while now, and your right on! Except for TrustPilot, not a fan. also not a fan a resellerreviews. A company really needs to start a review site that is not racketeering and extortion based. Hey Bryan! Absolutely, 100% agree regarding ResellerRatings (I think that’s who you were referring to). They use their prominence and integration with Google searches to gouge merchants on price – I think it was more than $200 / month for ANY merchant last time I checked. Someone who created a quality, affordable service to automatically collect, display and share customer reviews would do very well. I have been looking for the past five hours for a service that I can use to e-mail my past customers in order to ask them for a product review. I manage an ecommerce site that is already set up with a review form with rich snippets. It is kind of cool how a page gets starts shown by the permalink in Google. I got a call from Trustpilot a week ago and I really liked their system. The salesman had me sold until he said it would be $600 a month with a one year contract. I thought the price was outrageous. ResellerRating was $200 a month but from what I hear, the customer service is horrible. I want to create a system where ALL my product reviews come to MY website. I do not want another 3rd party website gouging me for this service just because they now appear in Google shopping. I like to control things. Anyone have any suggestions. So far I have only found MailBeez as a possibility. Yes I meant RessellerRratings. & Trust TrustPilot . Are you planning to use a plugin to send the email to dormant customers? We’d like to do something like this but aren’t sure how to select the customers by last order date. Yep, we use Klaviyo (www.Klayiyo.com) for our email marketing campaigns which has some powerful targeting capabilities. Wow, I learned some interesting tips from your post! I already started to implement your ideas of how to implement effective email marketing. Keep up the good work and really appreciate it that you are sharing your experiences! Thanks Daniel! Glad you found it helpful. Can you share a marketing plan for e-commerce? action plan would be great! your service could be the greatest option for the consumer. Love the part on measuring results, it’s really the only thing that matters! Really digging your podcast. Anyways, I am really trying to step up my game with email marketing. How does klaviyo with something like http://docs.woothemes.com/document/automated-follow-up-emails/? I like the idea of a one time payment vs monthly. It doesnt look like Woo can send the abandoned cart email unless an account is created. Is this the same with klaviyo? Great review here. Are you still using Klaviyo and do you still recommend it? We’ve been contemplating hubspot, but it may be more power than we really need, though I do love it!